You cannot make it up. It's like a bad Hollywood pitch meeting. "OK, get this. It's Sideways meets Dumb and Dumber." Only problem is I can't tell who's dumb and who's dumber! 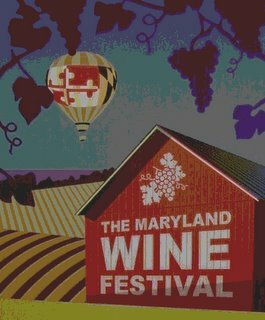 Can someone please tell me how Maryland's Attorney General J. Joseph Curran Jr. could possibly have thought that the answer to a lawsuit brought against the state of Maryland by a Pennsylvania winery and a Silver Spring resident to petition for the ability to sell direct to restaurants and retailers resulted in the quick fix of cancelling the same privledge for the state's 21 booming wineries? Can someone tell me why the law firm representing those two entities would endanger (with what some might surmise was a sloppily built case), not only the small, independant wineries of Maryland, but possibly endanger the whole independent wine industry of the entire eastcoast? The one agri-buiness that is doing well in Maryland is its small wine industry which has brought fame and accolades to that state. Can someone explain to me why that industry was crushed by the unthinking response of the State's alledged Attorney General, with a band-aid approach that we haven't seen the likes of since Herbert Hoover said there was no depression? Pennsylvania wineries want entry into the market. They are small, but fairly local producers in some cases. The state's laws prohibit such sales by wineries out of state. So first there is a lawsuit. Their seemingly questionable case is built on the fact that if Maryland wineries are allowed to sell direct, then out-of-state wineries deserve the same treatment under the law, especially with the Supreme Court striking down laws that prohibit inter-state shipping to consumers. But obviously no one at Mr. Robert Epstein's law firm, nor the filing winery nor the Silver Spring consumer, seemed to consider that they might needlessly expose the flimsy laws many states throughout the eastcoast enacted were to prop up high-end agri-businesses that residents wanted to protect. The wineries were a boon to the state, and many folks looked the other way rather than ruin a good thing. Local tax revenues were paid by the wineries, so the legislators were happy, and it was small enough that wholesalers turned a blind eye. But the lawsuit had the opposite affect. Instead of drawing attention to the new Supreme Court decree, it brought attention on a flimsy law written to protect and encourage a small flegling industry, and gave strong voice and hope to liquor wholesalers throughout the market. Funny, since Pennsylvania's liquor industry is regulated completely by the state, and the state imports wine directly from Maryland, this Pennsylvania winery wanted a reciprical arrangement, torpedoes be damned. It doesn't bother them that California has been dealing with the same unjust law for a number of years? Why the state comptroller felt it necessary to squash the small wineries rather than face the wrath of liquor wholesalers it charges yearly fees to is without question the silliest move of all. The comptroller did not need to issue an order rescinding a law that has been in effect for more than 54 years, and change the best laid plans of further seeing men and women. Comptroller Schaefer was equally to blame. He made the decision to hastily follow Curran's advice. He could have balked...or at least offered a better solution. Might it also be a coincidence that there are allegedly strong ties between the Comptroller and his staff, and the lobbyists representing the wholesalers? What was Mr. Epstein thinking about? What was Mr. Curran thinking about? What was the Pennsylvania winery thinking about? Don't you think the wholesalers in New Jersey and New York, who pay hefty fees for their liquor licenses are watching this with great concern? Maybe the wine lobby in New York State might be bigger and louder, but there are a number of small wineries all over the eastern seaboard who are put in danger by wildcat lawsuits like Mr. Epstein's? Did Mr. Epstein consult the Maryland Winegrowers before stirring up this hornet's nest? Did he consult local wineries in the other states lawsuits he has joined? Why is an Indianapolis lawyer filing a suit in Maryland for a winery in Pennsylvania? Did not Mr. Curran have a number of options he could have enjoined instead of instantly striking this blow against his state's own wineries? Could he not have allowed shipping if taxes were paid by the winery into the state coffers until a better law could be enacted? And don't hand that youngsters stuff over...you can order viagra online, and percoset, and other drugs. Are there thank many teenagers asking for a Pennsylvania Pinot Noir or Merlot? Wine is a thing so many teenagers are sneaking into keg parties? Give us a break. And how much money does the Pennsylvania winery think they are going to roll-up in sales after this little fiasco? Indeed, California, who would have a lot more to gain, did not file the suit. Maybe they were smart enough to let these folks do the work for them? While I am a fan of many Pennsylvania wineries, how many poeple in Maryland are drinking, or even ordering or inquiring about, Pennsylvania wine? Come on. "It's a death knell for the smallest wineries," said Kevin Atticks, executive director of the Maryland Wineries Association. Mr. Epstein and Mr. Curran seem to have replaced what earlier, seemingly wiser, lawmakers and lawyers fully thought through back in the late 1940s and early 1950s. That these small wineries preserve a way of life that is increasingly fading in the megalopolis that is the eastcoast, goes without saying. Their demise will only increase, like mushrooms, the McMansions which have sprouted up on many of the former farms of Maryland and the rest of the 95 corridor. Reckless is a word that comes to mind. When they go to cast the next Dumb and Dumber: The Sideways Trip, who gets to play Mr. Daniels' character and who gets to play Mr. Carrey's character? I can't wait for the scene when Sandra Oh smacks them both in the face with a motorcycle helmet. Unfortunately, the ones getting hurt won't be them, it will be the wineries and you and me. I am a huge fan of film noir, while my wife refuses to watch anything made in black-and-white save Wizard of Oz. I am also a fan of Pinot Noir. Recently, I tasted some noir-ish new wines, and two stood out head and shoulders over the others. 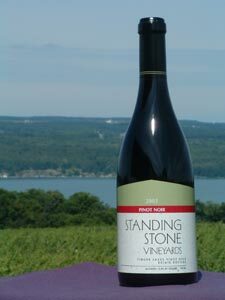 Firstly, a 2003 Standing Stone Pinot Noir. I know, I am a sucker for Standing Stone. But I cannot help but gush over this exceptional new wine. It's a light bodied red. It's got nice cherry notes on the nose and on the palate. It starts off with bright fruit and a little blackberry/plum undertone. And then is a long, smooth finish with just a slight touch of pepper. No dry bite, like some over peppery Pinots. It's a nice smooth finish. An excellent wine. I cannot tell you enough how much I liked this wine. The second wine I tried was the Warwick Valley Black Dirt Red. The wine is named for the black dirt fields surrounding the area between Vernon, New Jersey and Warwick, New York. I have been told that an actual border war, which drew blood,occured between New York and New Jersey natives over this very fertile farming district. When I ralized it was a Baco Noir, I hesitated. Dominique and I are generally not Baco Noir fans. Now, I have not tasted the recent vintages of Benmarl's Baco Noir, which I have heard an awful lot about, and am dying to try. But I have not been able to get my hands on a bottle recently. Like many raised on French, Italian and West Coast wines, I too wrinkle my nose sometimes when confronted by a red hybrid. I do not have the same reaction to white hybrids, which I embrace enthusiastically. So I poured a glass for Dominique, and myself and a friend of ours. The nose is perplexing, but eventually blackberry and currant start to come through. Then we swirled it around our glasses. The color and legs were very nice. Now came the big moment - the taste. I closed my eyes and thought of the empire. And I was pleasantly surprised. There was lots of cherry, dark cherry, and some blackberry and plum, and with a touch of pepper. It was bone dry and smooth. I was very happy. An exceptional Baco Noir! Excellent! And, at $8.99, it's the deal of the century. A great surprise. Go out and get a bottle, put on The Maltese Falcon or The Big Sleep, open up a bottle of either of these two wines, kick back with a romantic friend, and have yourself a noirish evening! In my book, I highly recommended the best regional wine shop on the east coast, Vintage New York. I have spent many an hour mulling over wines at the wine bar, taking in the fresh and vibrant flavors of the region’s best wines. Now, you can drink those wines paired with the foods they were meant to be tasted with, matched by one of the best restaurateurs in the city. And it’s an incredibly chic setting as well, with two floors, the second of which over looks the shop. This is a place to be impressed by, and you can use to impress others. And you can have lots of fun, as I did. Robert and Susan offer the “pleasure of a well-paired food and wine combination; to support our region's small farmers and artisan producers.” But that’s not all. It’s simply an incredible treat. Now, I am only a blogster, but look what real writers in the genre have to say. “The warm house-smoked salmon went nicely with the Lieb Pinot Blanc, and a floral Palmer Gewürztraminer made perfect spice- complementing sense with the Thai dipping sauce that accompanies moist Long Island–duck meatballs. But the biggest surprise was the Rivendell Cab, an unexpectedly perfect match for the gooey richness of the “chocolate fantasy,” an oversize take on the molten, flourless, soufflé-like staple of dessert lists everywhere,” reported Eat Cheap column of New York Magazine in August of 2005. “The cafe is madly stylish, with mustard-and-white walls, a communal table filled with chattering SoHo-ites and a central twostory tower stacked with bottles. The short menu is a list of small but by no means too-small plates, all of them made of ingredients from guess where…If you remember co-owner Susan Wine's restaurant, the Quilted Giraffe, you won't be surprised to learn that the food here is good. After nibbling on roasted almonds ($3) and olives ($4), we shared duck meatballs with sweet and-hot Thai sauce ($9), a fat artichoke whose leaves we dipped in horseradish mayo ($9) and a Spanish tortilla, or frittata, that was baked in a thin pastry crust ($5). Two paninis were warm and crunchy in their flattened ciabatta rolls; we had both the vegetarian version filled with sheep's milk Camembert, mango chutney and roasted red peppers ($7) and the heftier one filled with slices of peppery venison sausage and touissant cheese ($8). And if a salad of duck confit and pistachio nuts ($10) sounds over-thetop rich, what would you say to "Chocolate Fantasy," a warm chocolate souffle into which the cook drops a big scoop of mocha ice cream?” wrote Irene Sax, for the New York Daily News. Some friends of mine and I recently went unannounced for lunch. We shared four things: duck meatballs, Beggar's Purses of smoked trout mousse with Petrossian American caviar and salmon roe, Roasted Hudson Valley Foie Gras nuggets with waldorf salad, and Pumpkin custard. All were exceptional. Now, I’ve got to take my wife, or she’ll get jealous. And it’ll be a great way to score points. Since late December, I have been on sabatical, hiatus, whatever you want to call it. Many things have changed in my life, many for the better, but I never lost my taste for wine, especially East Coast wine. Well, I am back. And with a vengence...so let the blogging...and the drinking, begin.